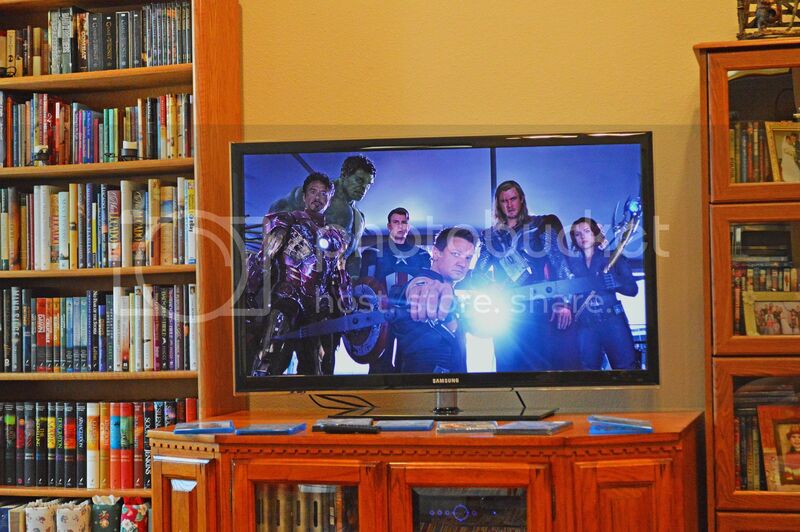 Hubby and I have always enjoyed the MARVEL movies and make sure to go and see them in theater, or as soon as they’re released to DVD, every time there’s a new one! 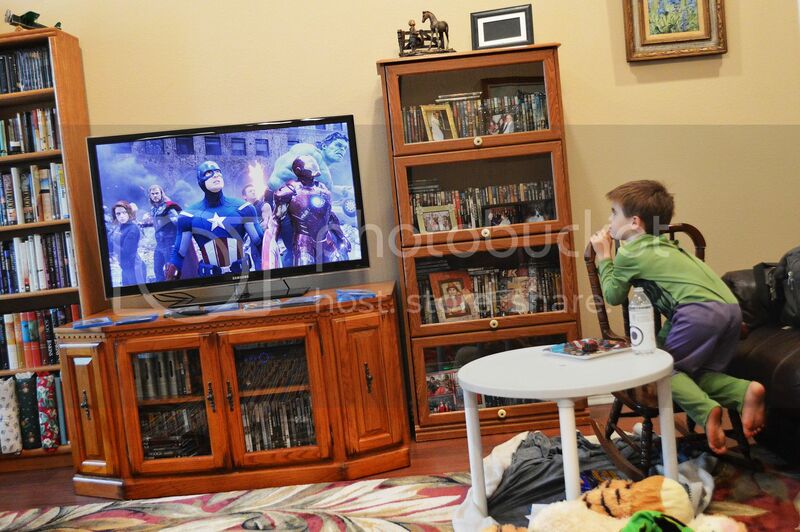 Our favorites are Thor (<–my personal favorite….swoon), The Avengers, and Captain America, and just recently we decided the kids are old enough to start watching a few of them with us! 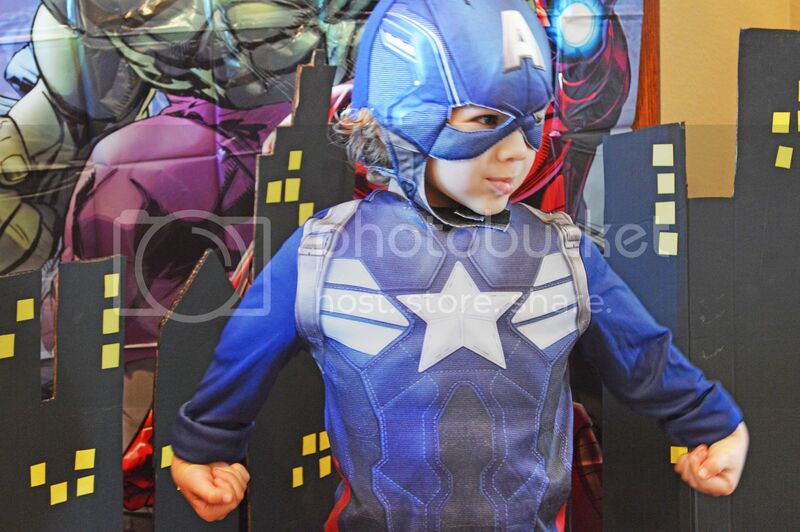 Because of our love for the first Avengers Movie, we are super excited about MARVEL’S The Avengers: Age of Ultron! coming out on May 1st! That’s hubbie’s last day of finals, and I can’t wait to sneak away for a celebration date to go see it! 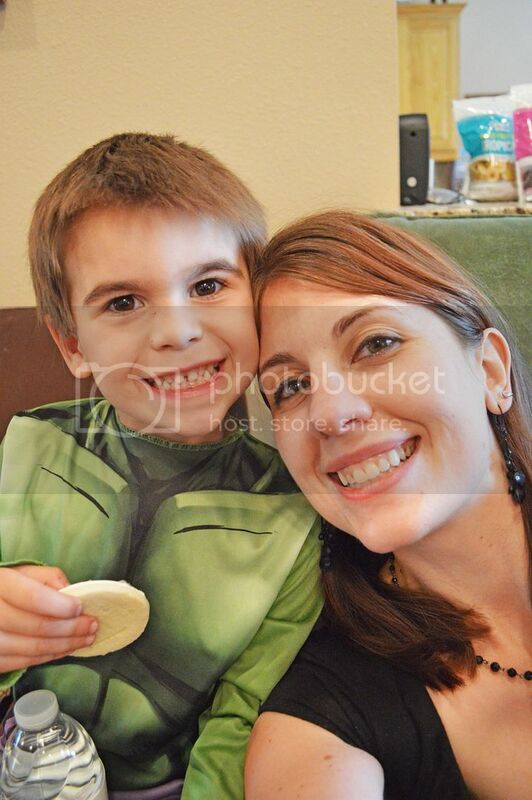 All of this excitement got me to thinking that a Movie Watching Marathon would be super fun, and I have a ton of mom friends with kiddos who have birthdays coming up soon (yey all those spring and summer babies!) I wanted to throw a big, epic party that would be a ton of fun for everyone — but there was just one problem, I’m not talented. Now, don’t get me wrong, I’m not playing the false humility card–I really *am* talented, but I know where my talents lie, and where they do not, and epic party planning & throwing is definitely in the “not” category. If you fall into that category, too, never fear! That’s what this post is for!!! 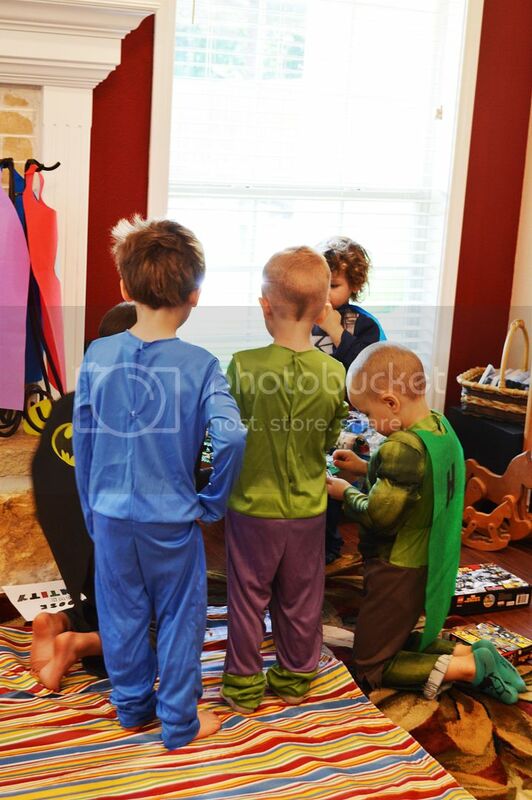 You see…*I* might not be superly crafty or a super party planning genius, but my friends and Pinterest ARE! 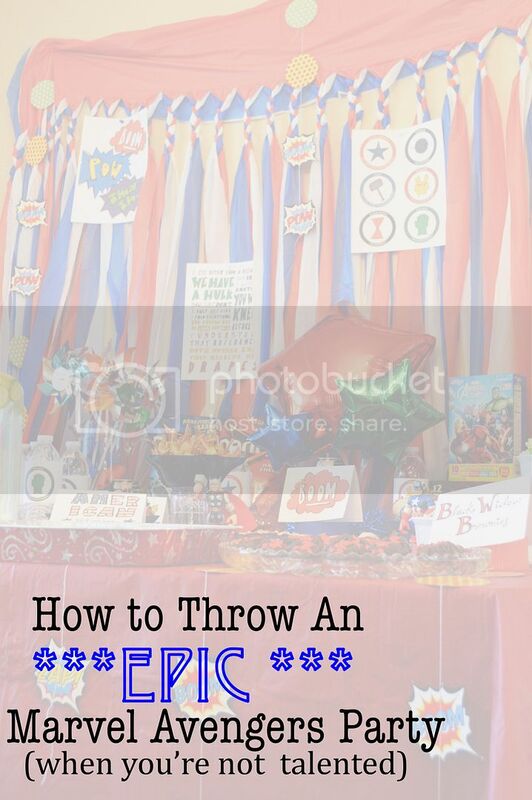 Armed with that knowledge I decided to attempt my first ever “epic party throwing”. 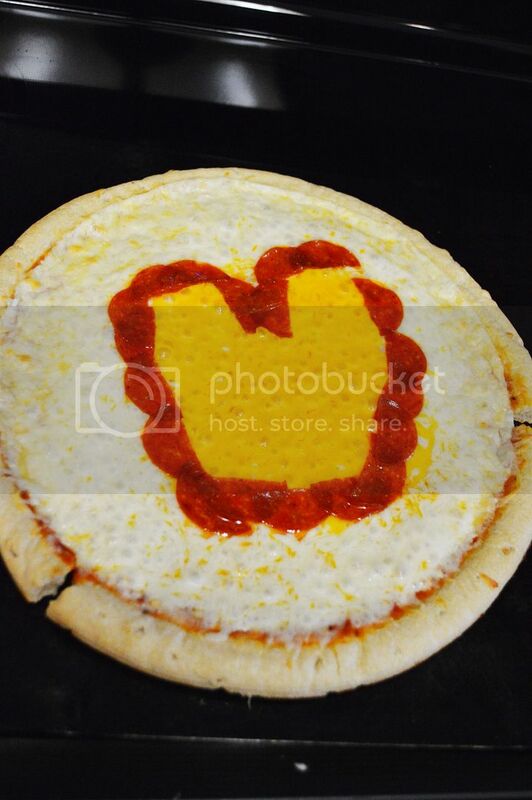 How did it turn out?! 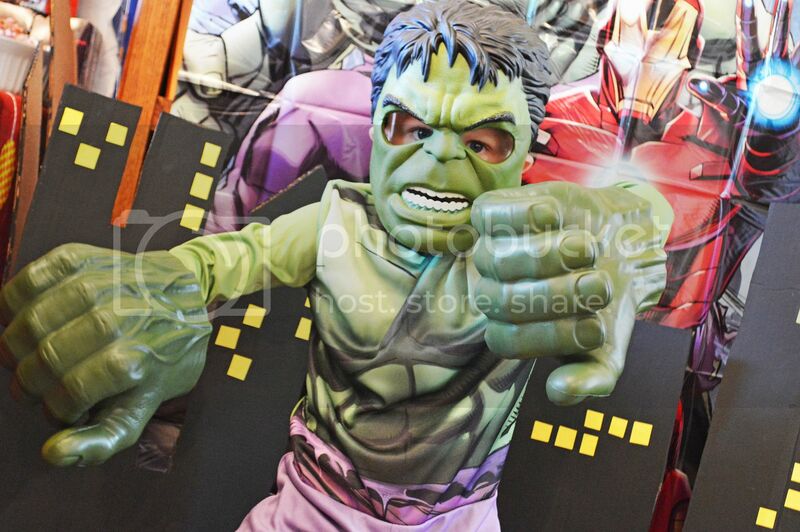 It was a “Smashing Success”!!!! 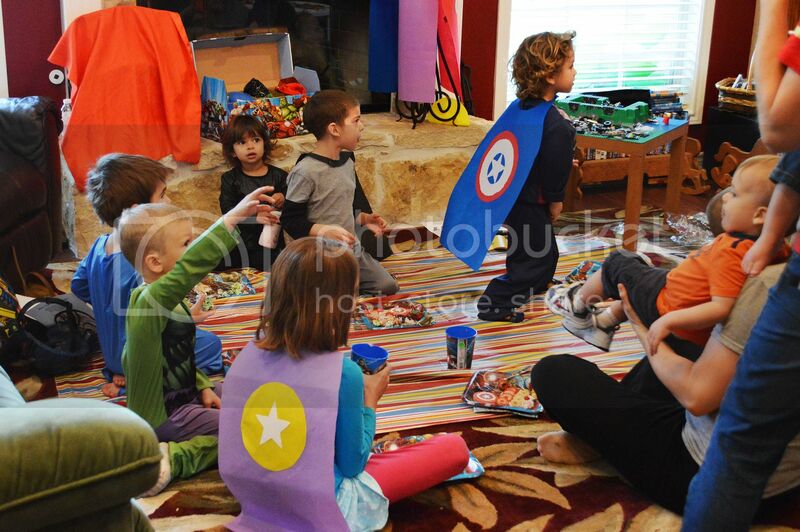 I had 8 moms show up all with at least 1 kiddo in tow–many with up to 3 and two even had their hubbies sneak along because they are such MARVEL Fans (brave souls!!!) 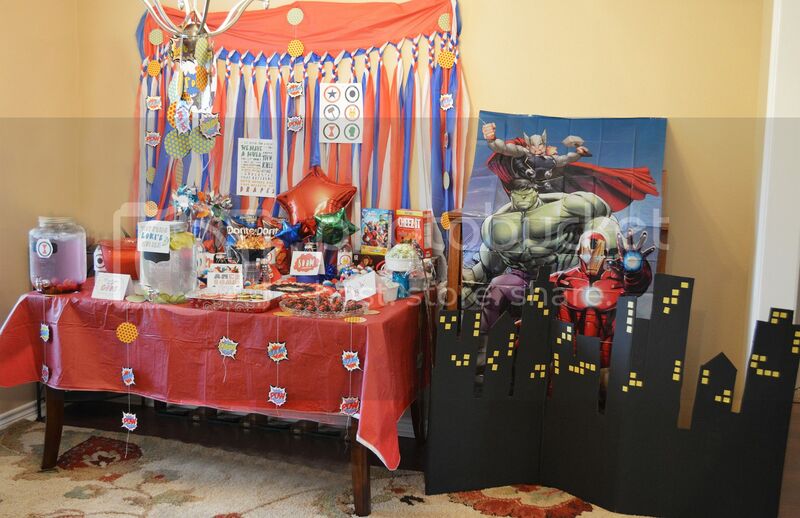 Here are some of my absolutely most favorite shots from the party and then I’ll get into all the great details about how YOU can re-create this epic party with all the bang and non of the fuss! Fun right?! 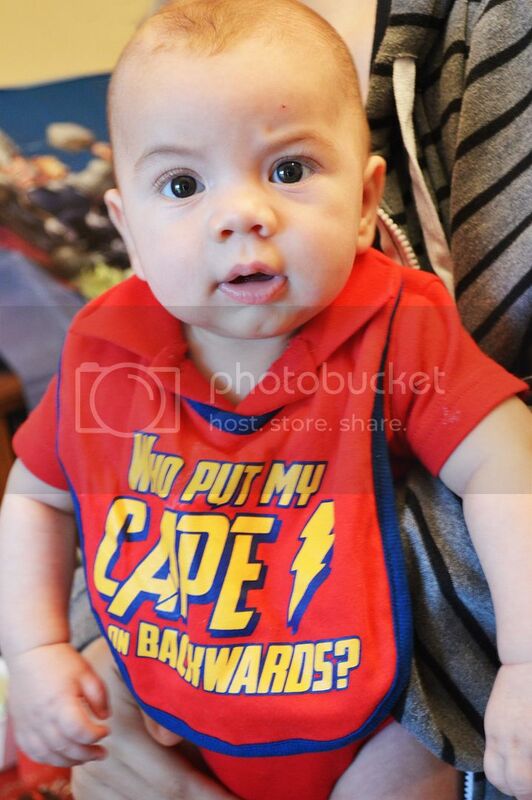 I got SO many adorable shots from the party I wish I could include them all!!! 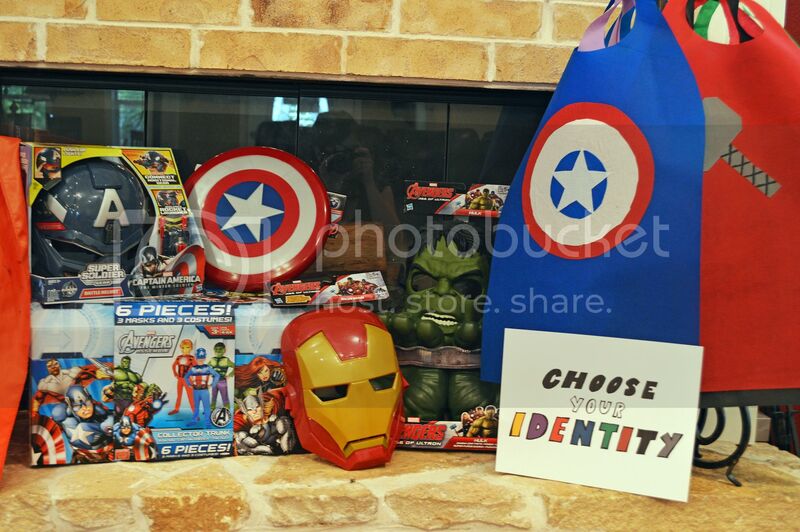 Ok-so now I know you’re dying to throw your own beyond epic Avenger Party for your crew! Here’s all the details!! First off you’re going to want to create a Facebook group or Event for the party and pull in all your talented friends to start bouncing ideas off of and to assign people tasks. 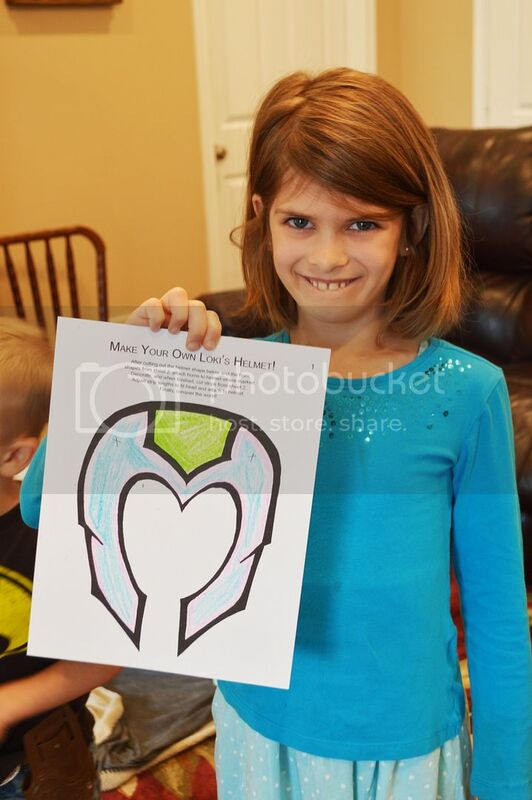 You’ll also want to create an Avengers Pinterest Board to keep track of all your great ideas! No worries–here’s where you can repin this post easily right here! 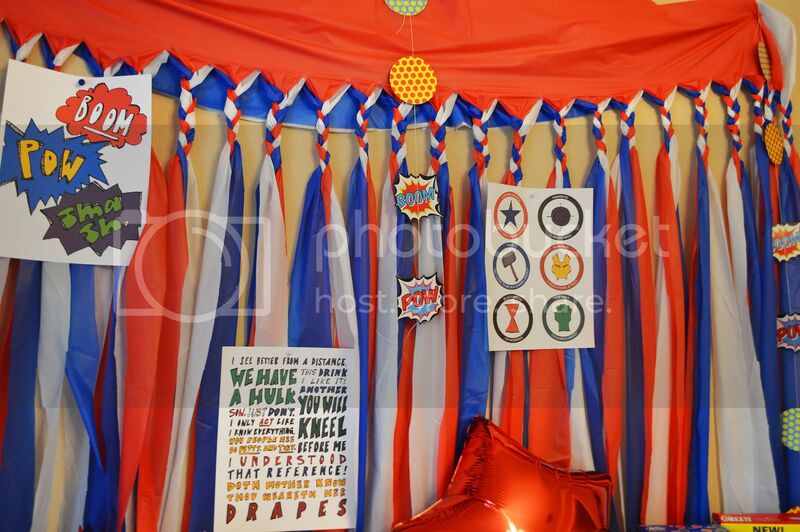 Once you get your creative juices flowing create a document covering the topics of food, decor, games/crafts, and favors. 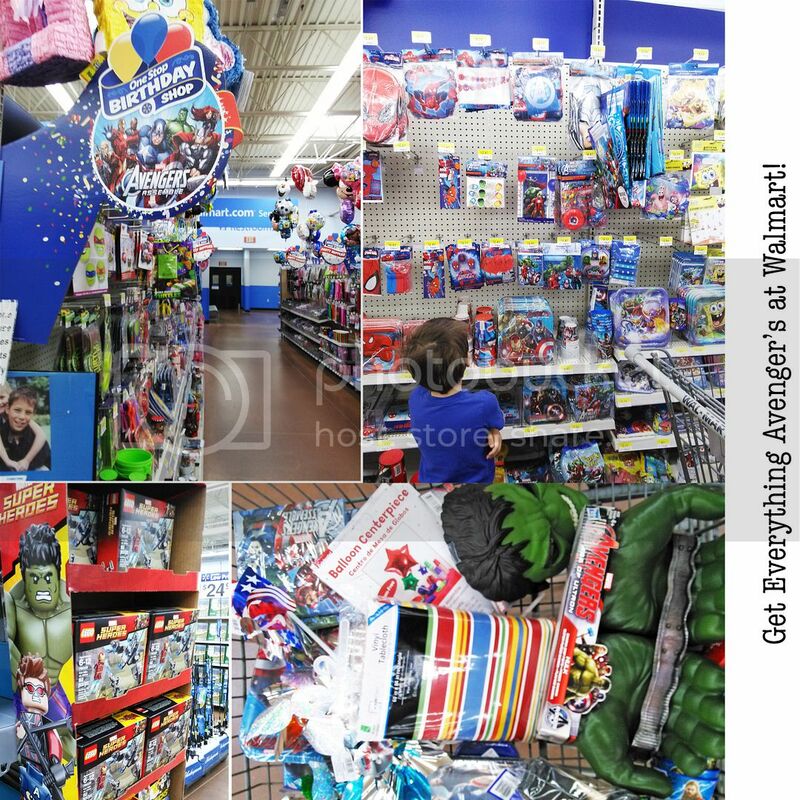 Once you have all your things planned it’s a one stop shop to Walmart for all your Avenger’s party needs!! Food — Any party without awesome munchies will never reach Epic Status! 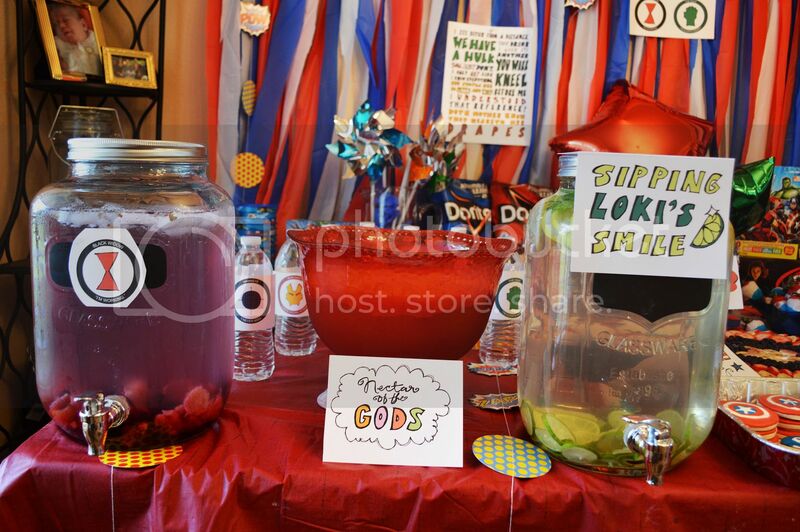 Here is what we had to make ours party especially epic! Candied Colored Popcorn in Red, Green, & Blue I followed the Eagle Brand recipe but split it into 3rds so I could get 3 colors from one batch! 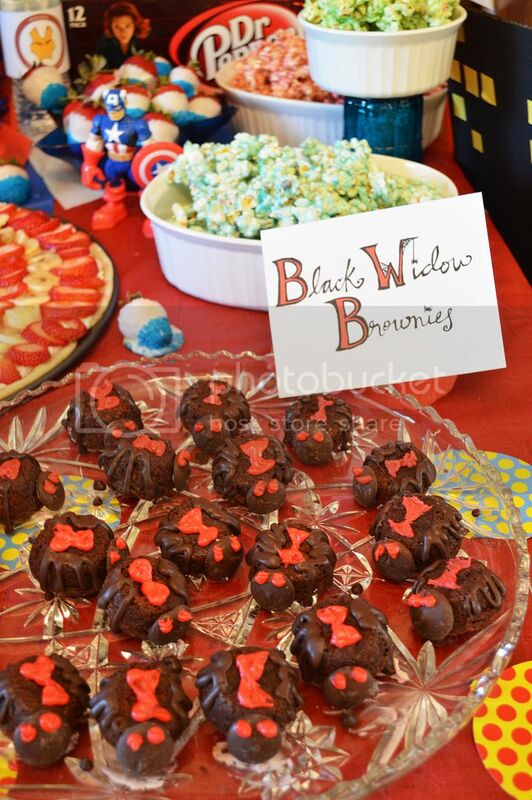 Black Widow Brownies I made my classic favorite dessert ever Tuxedo Brownies as the base for these adorable and tasty little creations! Tutorial coming soon! 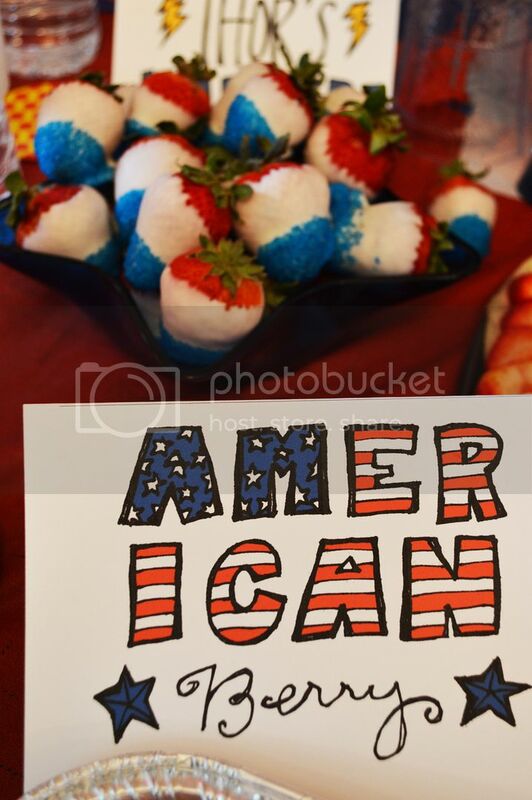 The American Berry was inspired by countless Pinterest pins–love how elegant but simple these are! Captain America Shield Fruit Pizza — this was probably the biggest hit of the dessert items with everyone raving over the taste, check back soon on the blog for the recipe! 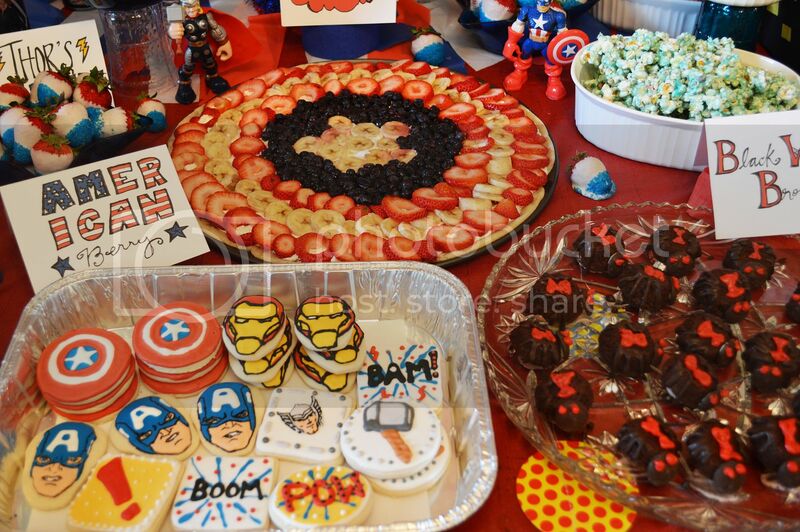 Avenger’s Custom Cookies — These were my “Signature Piece” for the party. You might know that I’m not much of a cupcake or cake gal, but cookies are the way to my heart. Luckily I have a friend who makes AMAZING cookies as a business from home, and she’s the one who created these epic masterpieces! Just ask around in your circles and find out who decorates cakes, cupcakes, or cookies from home — it’s worth spending a little to have a “no one else will have this” item at your party!!! 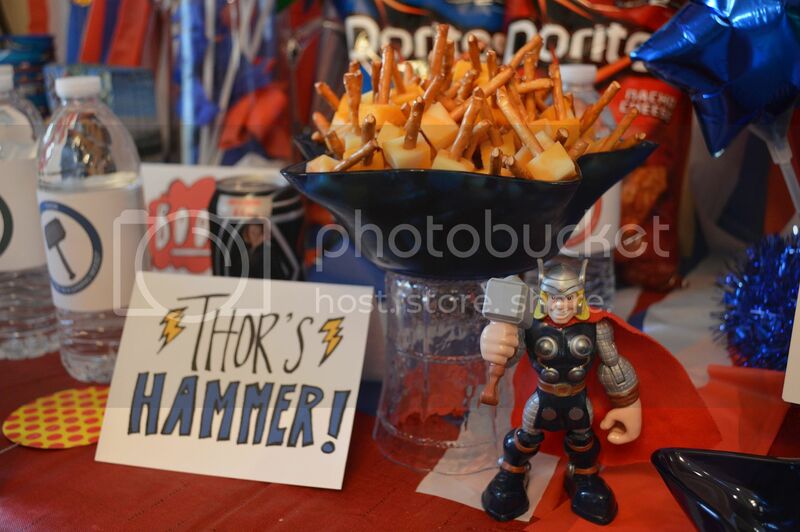 The rest of our munchies were sweet and simple–which was a perfect balance after all our special items–I was able to find all of these with special MARVEL’S The Avengers: Age of Ultron packaging so they made the perfect addition to the tablescape! Now that we had the munchies covered it was time for Drinks! 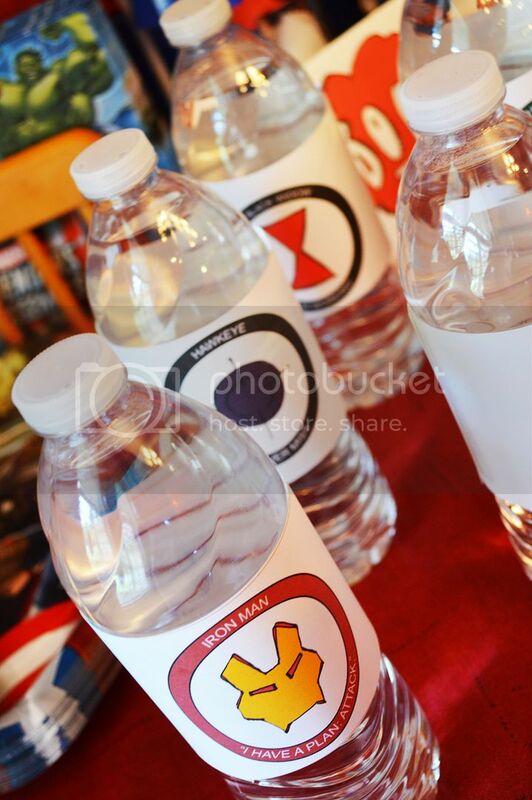 I had the Dr. Pepper Cherry, but since lots of littles would be attending I wanted a nice, big mix up of delicious and healthy! 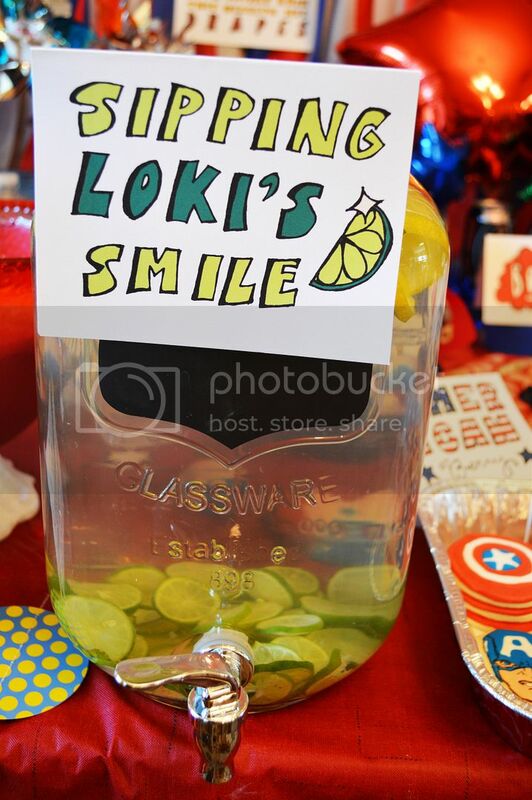 Sipping Loki’s Smile Spa Water made with lemons, key limes, and mint! 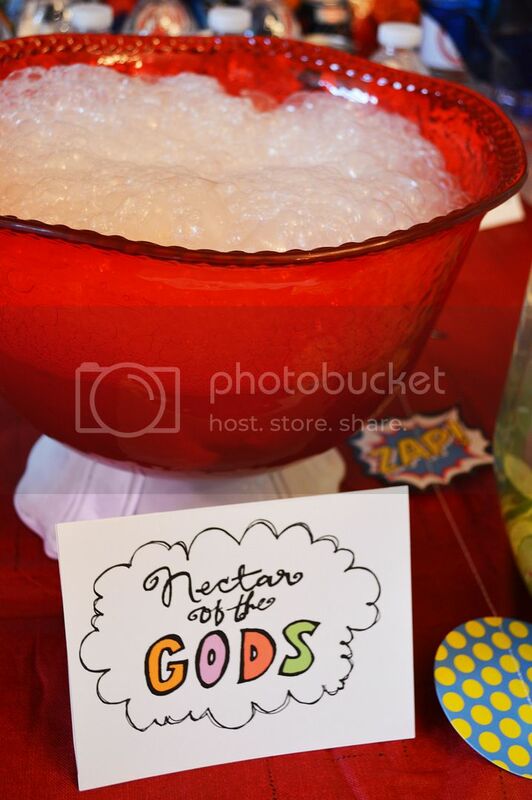 Nectar of the GODS Classic party punch–just put in scoops of rainbow sherbet and pour your favorite clear carbonated beverage over the top! 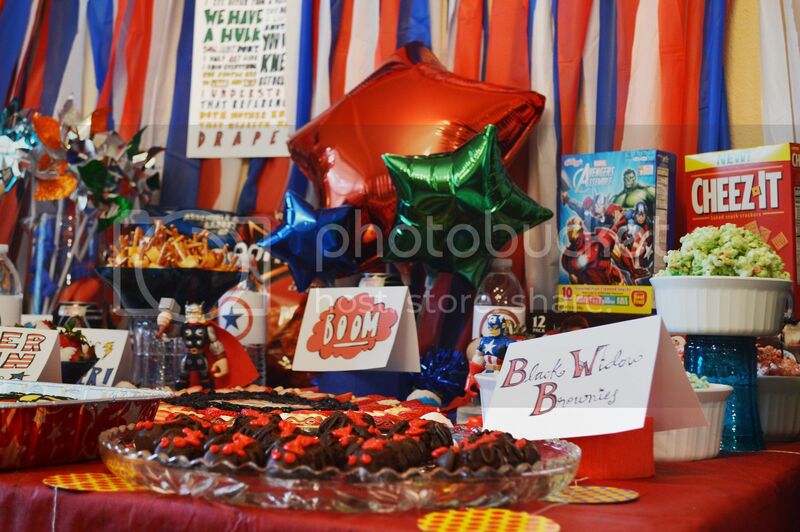 All that gorgeous food needs a proper gorgeously epic displaying–and that’s where epic party decor comes in! I loved using a mix of ready made items that I picked up at Walmart, things I had around the house, items from friends, and DIY pieces! Here’s the major things so you can get them too! 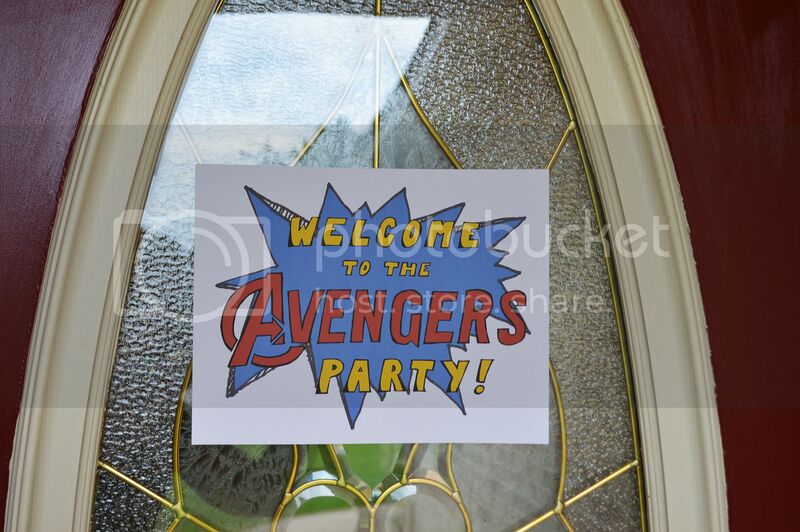 I have showed you how we are preparing for The Avengers: Age of Ultron release with my party plan! 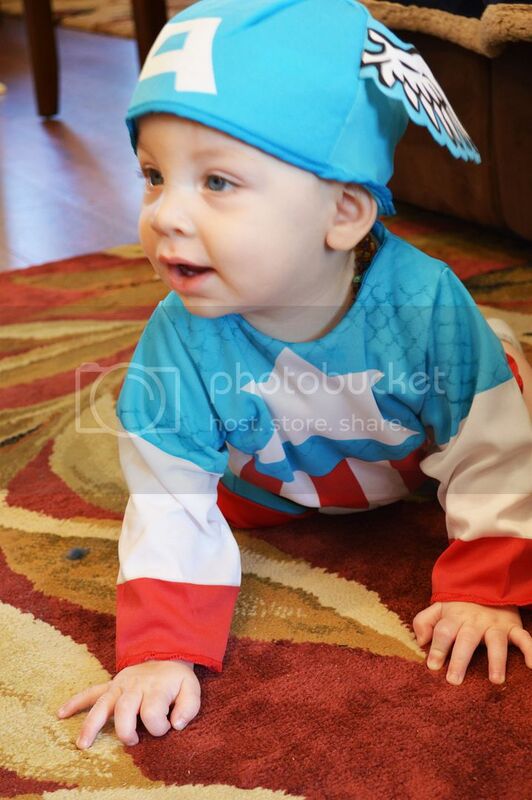 Leave me a comment and let me know what your favorite part of our party was!!! 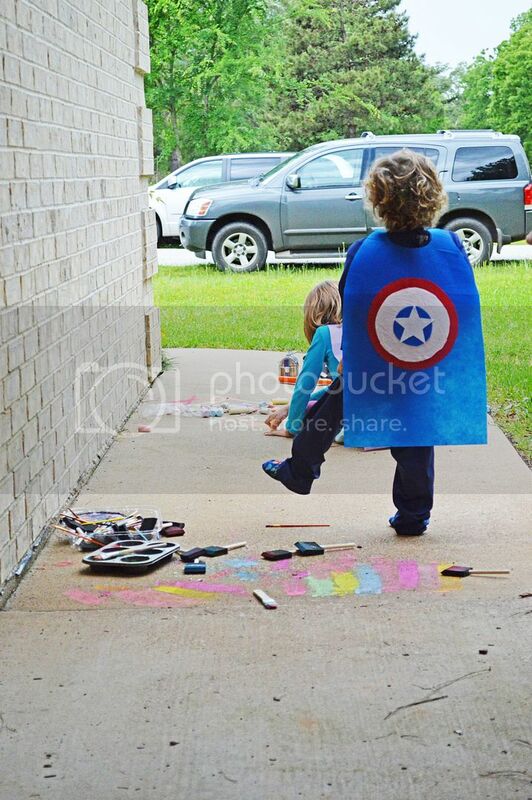 Keep the fun going after the party with the Super Heroes Assemble APP that is now available in the iTunes and Google Play store (starting April 15th). Love all these great ideas! Pinned!